Truly, it is not the end, it is just the beginning of a wonderful blog about my cupcake experiences. I plan to continue with my plan to find the best cupcake in America, a cupcake that manages to supersede that of Georgetown Cupcake, the current winner in my book. At this point, I would like to reflect and rate my favorite ten cupcakery experiences over the years. Now that you know the most important information, I would love to make a game plan for what I will do next, through the coming years as a cupcake enthusiast. I am interested in making a bucket list of cupcakeries which I would love to visit. That way, I could document my cupcake excursions through the coming years, once my English 137H course ends this summer. Red Velvet Cupcakery- Washington, D.C.
Lulu’s Sweet Shoppe- Boston, Mass. In the time between the Summer Bridge of the Pennsylvania State University Millennium Scholars Program and my actual freshman, Fall semester, my family will probably take two trips. I need some well-deserved rest and relaxation after this stressful summer. We plan to visit Pittsburgh, Pennsylvania and Boston, Massachusetts. I will probably find a new cupcake place besides the norm of Georgetown Cupcake, in Boston, MA. There seems to be a plethora of wonderful options. In addition, I hope to go to Philadelphia, PA to visit my sister in her new home! 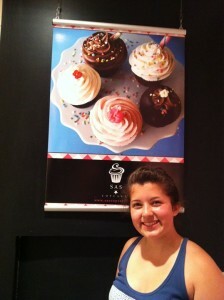 There, I plan to try the cupcakes at Whipped which seems like an extremely popular spot! I would love to get to New York City as well and there are innumerable options to check off of my bucket list in the Big Apple. I am incredibly happy to have made the decision to blog about my passion for cupcakes. This experience makes me realize how this love has truly been a treat. I can’t wait to continue taking options off of my bucket list, moving into the future. Until then, don’t forget that life is short… eat a cupcake. Now that I am thinking deeply about my other cupcake experiences, I remember my trips to Cambridge, Massachusetts to the Harvard University Invitational for my high school speech and debate team. My primary coaches, Sarah and Joe, whom I previously mentioned about my Kansas City experience, went on the hunt for me while I was competing in rounds. They found the cupcakery that I was looking for on a short walk from our hotel. It was a lot closer than we thought. After long days competing in extemporaneous speaking, a cupcake was a great finish to my day. 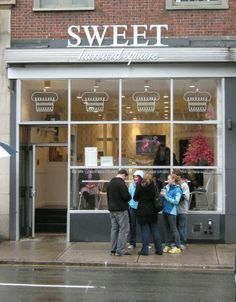 My first experience with SWEET on Harvard Square in Cambridge, MA was in ninth grade on President’s Day weekend of annual competition. It was between rounds of international economics and foreign policy. I was desperately in need of a “pick-me-up.” So, my best friend, Emmalie, and I walked to SWEET in the middle of the day on Friday of President’s Day weekend, four years ago, and it smelled wonderful. 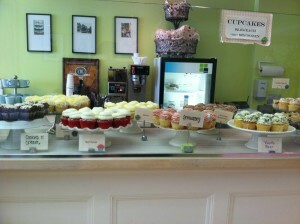 There was a large selection of cupcakes and I was pleased by the cute decorations and furniture. My friend has a severe dairy allergy, so she unfortunately just watched me eat their Red Velvet cupcake. Surprisingly, the actual cake was moist, yet darker in color than normal which is slightly unappealing. The icing was good, even though it was slightly thick. Overall, the cupcake was good but not amazing to be sold for over three dollars per cupcake. For the price you pay, you would expect more intricate decorations, sprinkles, garnishes or themed toppers on the cupcakes. They serve their cupcakes on a plate with a fork and, personally, I love that approach to eating cupcakes. I enjoy eating and savoring the sweetness in nice, small bites. With this approach to eating cupcakes, you can avoid getting that little bit of usual icing on your nose when biting into a cupcake, loaded with icing. With all of that being said, Sweet looks to be a safe and dependable resource when catering any special events. They sell both large and small size cupcakes. It can also be a great birthday treat to buy a full size cupcake for someone. All in all though, there isn’t too much to admire here. The appearance of the store is adorable, though. The store front is completely glass and offers a nice view of the hustle and bustle Brattle Street in Cambridge. In February 2015, my speech and debate team was trapped in Boston due to an extreme blizzard over President’s day weekend. It was a great place to get out of the bitter cold for some warmth and a bite of sweetness. Its a nice place for a quick break if you’re walking around Harvard Square. Over my many trips to Harvard Square, I have tried quite a few of their cupcakes and red velvet is definitely their best. So, if you decide to make the trek up to Boston, I have two pieces of advice if you go to sweet. 1) Buy the Red Velvet Cupcake. 2) Don’t go when there is a blizzard that will shut down the city and its transportation. You never know what you’ll find when you aren’t looking. As I wrote in my first post titled “Lets start at home…” my younger brother’s competitive ice hockey career has taken our family around the country and into Canada. Needless to say, I have taken the Richards family off of the beaten path quite a few times! But, they still find a way to love me since nine times out of ten, these “trips off of the beaten path” result in cupcake success! Sometimes, the “best cupcakery” according to my research, doesn’t turn out to be too great. On these hockey trips between the ages of ten and sixteen, I would like to venture off, especially if the ice rinks were near towns, because you can only play so many arcade games and read so many books in twelve hours at an ice rink. The games are spread apart enough to give the players rest but not enough to actually do something interesting with the time, away from the rink. At one of Luke’s first ice hockey tournaments while playing with a team called the Wilkes-Barre/Scranton Junior Penguins, I had one of those experiences. Luke was playing at a rink on the campus of the University of Delaware. It was a weekend long tournament and at the age of thirteen, I was desperate to find something ELSE to do. I begged my Mom to take me for lunch downtown, on the main street of their campus. So, we went to our normal lunch spot at home, Panera Bread. After we ate, my Mom and I wanted to walk around. As we walked around, we stumbled upon SAS Cupcakes at the University of Delaware in Newark, Delaware. 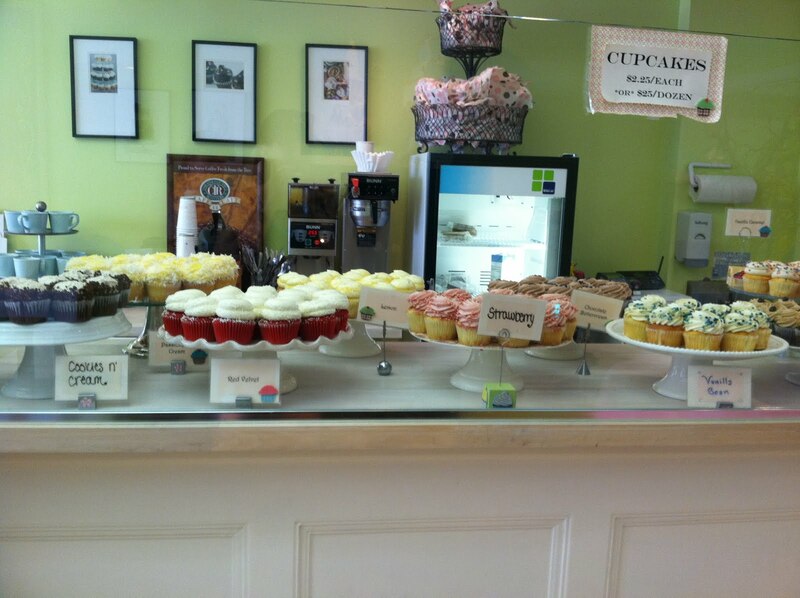 We walked in and the cupcakery was cute and adorable! They had quite a variety of cupcakes with at least a dozen different flavors. All of the cupcakes looked quite appealing with their little, colorful candy straws sticking out of them. I tried their Red Velvet, no surprise there. My Mom tried the Vanilla/ Chocolate which is vanilla icing on chocolate cake. Our main gripe was that there simply seemed to be a bit too much icing. It was a little bit of a letdown because they just crossed that fine line of enough vs. too much in the sweetness department. Their cake seemed dense…if that makes any sense. The “density” came from a lack of moisture, maybe! I’m not sure what the cause was but their Red Velvet didn’t rank at the top of my list. They had a nice taste in cake and icing. The icing to cake ratio was off for the non-Red Velvet flavors. It looked like vanilla Mt. Everest in icing sat down upon a chocolate cupcake…maybe that’s where it lost the moisture! Anyways, it was a good find. I would recommend SAS Cupcakes because they were reasonably priced for the quality cupcake in which they were providing. If they had been over $3 a piece, I could have advised others to go somewhere else for dessert. Until next time…life is short, eat a cupcake! A few summers ago, a friend of mine and I decided to take a day trip into New York City. It got off to a bumpy start and we ended up leaving a few hours later because we accidentally missed the 6:30 A.M. bus. Unfortunately, we had to wait until 10 A.M. to take the next bus. Since this experience preceded my days with a driver’s license, my friend didn’t have a car, we had to walk around the downtown of my city to pass the time. We were too embarrassed to call for a ride to come back and pick us up. So, needless to say, our days plans were pushed back but, lucky for us, we didn’t have any plans! Alanna and I arrived into the Big Apple around noon on a hot, July day and we were ecstatic to finally be there. We left Port Authority and walked to Times Square. Since the both of us are lovers of Broadway, we decided to stop at TKTS, a discount ticket booth, to buy inexpensive student tickets for a show. Once we bought tickets for that evening’s production of Chicago, we needed things to do. 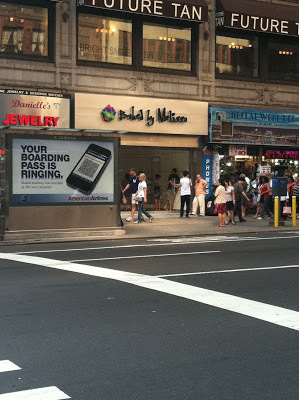 We eventually found ourselves venturing around the shopping district of Manhattan. Alanna and I stumbled upon Baked by Melissa. 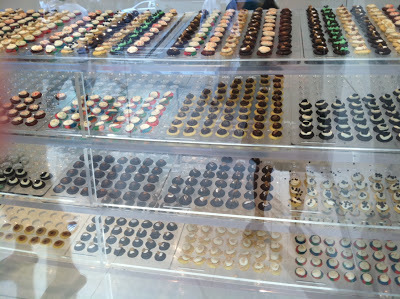 This cupcakery has four locations in New York City and I visited the Fashion District one. This façade looked adorable. Since there was a small line. I had to go inside to try. Baked by Melissa is unique in that the shop only sells mini cupcakes. They have a wide variety of flavors but there is no different in size. I would compare each cupcake to the size of a half dollar. From the experiences that I have had in my house, it looked as though you could eat one cupcake in a single bite. Each bite of goodness sat in a case full of tiny holes, only large enough to fit one cupcake. For the customer, it was incredibly aesthetically pleasing and increased my expectations for the cupcakes. Soon enough, I found my “bite-size” assumption to be true. While the cupcakes were tasty, they were a little too small for me! I felt as though there was something missing. Maybe it was that there didn’t seem to be enough icing on some of the cupcakes. But, their small size compensated for being tasty and not getting dry, quickly. I vividly remember enjoying the Chocolate Chip cupcake which was yellow cake with white cake and chocolate chips on top. Besides the strong cream cheese flavor, my usual of Red Velvet was still good as well. For someone who tries not to eat more than one regular sized cupcake for each of my visits, I liked having the opportunity to buy a whole dozen for my friend, Alanna, and I to share. After eating six cupcakes, I felt a lot less guilty due to their size. Also, they were relatively inexpensive at the time. I believe we bought a dozen for only $10. As you can tell, Baked by Melissa was a great place to accidentally visit.